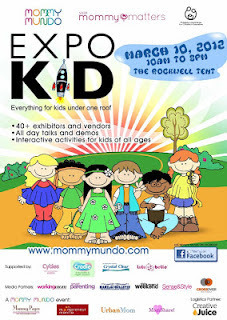 EXPO KID year 4 is set for March 10, Saturday at the Rockwell Tent. This year's EXPO KID will feature 4 activity areas for kids of all ages, namely, CAMP ADOBO (a kids camp that stirs up and entices your child'sawareness and appreciation for the Filipino culture and it's richcultural values), MY MASTERPIECE MOVEMENT (one of the most dynamic multi-artsschools in the country today), HAPI HOMESCHOOLER (the homeschool association of the philippine islands gives us a taste of a homeschoolers' life) and ENDERUN (will give a taste and sneak peek into their unique course offerings for moms and children this summer). Entrance to Expo Kid year 4 is only 25 pesos per person. Kids below12 years old get in free of charge. Mommy Mundo passport holdersalso get free entrance upon presentation of your card. 100% of registration fees go to MomShare outreach projects. All attendees will be treated to- yummy Lulubelle Frozen Yogurt samplers- family photo from Fantasy Kiosk- There will be Crystal Clear water stations situated around the venue for free drinking water. There is also a kids inflatable at the foyer area courtesy of FUNRANCH. For nursing moms, there will be a breastfeeding lounge. You can also look forward to Mommy Mundo's trademark expo area,where you can shop and learn about the latest products and services. Another busy day for you! yes, it'll be a busy day. tara, punta tayo. Kita kita tayo dun.